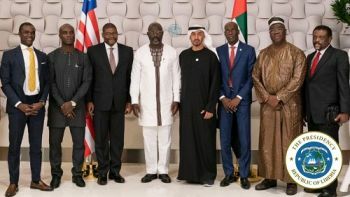 United Arab Emirates - Barely hours after securing huge commitments from his hosts to invest in Liberia’s energy, road, health and education sectors, President George Manneh Weah on the second day of his state visit to the United Arab Emirates successfully pushed the case of his country’s agriculture and transport sectors which he said are critical to pulling his people out of poverty. “Liberia has a very rich soil, which is further patronized by six months of rain, six months of sunshine absolutely favorite for anything to grow,” Weah hypnotized a group of agriculture investors, including the Elite Agro Group which has farms and other agriculture projects in Morocco, Egypt, Ethiopia, Senegal and Mauritania. The President’s meeting on Wednesday followed a series of prior engagements which the President and delegation had made with the UAE hosts who have accorded them incredible reception since their arrival there this week. Then on Wednesday, March 20, 2019 H. E. Dr. George Manneh Weah held fruitful discussions with Ahmed Al Zeyoudi, UAE Minister of Agriculture and Chief Executive Officer (CEO) of Elite Agro Group. There were positive responses from the hosts. In his presentations, the Minister and Elite Group CEO, Ahmed Al Zeyoudi told President Weah and delegation that Liberia could soon begin feeding other nations if UAE concessionaries are given the opportunities to invest in the Country. Mr. Zeyoudi bragged that UAE’s investment successes recorded in other African countries, including Egypt, Morocco, Ethiopia and Senegal constitute enough reasons for a win-win partnership in Liberia. “I want to partner with the Government of Liberia to ensure that the country reaches its potential, and our engagement is more than exploring mere investment opportunity,” he said. “Partnership is a proof of commitment to do business,” he said further, asking the Liberian Leader to allow him send a team of experts for on-the-spot assessment next month. In another development, Ashok Leyland and Transport LLC, has expressed interest to solve Liberia’s Public transportation headache. The Group’s Chief Executive Officer, Tarek Musa, said his organization is ready to offload 300 buses as a starter in Liberia. “We don’t only want to ply the street of Monrovia with buses, but as we’ve done in Cote d’Ivoire, Senegal and Gambia, we want to bring in trucks and four-wheel vehicles to meet the needs of rural Liberians,” Mr. Musa said. President Weah thanked Ashok Leyland and Transport LLC for expressing interest to invest in Liberia’s transport sector. He invited them to Liberia to meet with authorities of the Ministry of Transport to work out modalities for future investment. President Weah also encouraged Ashok Leyland and Transport LLC to also consider water transportation as there is a huge potential for this in Liberia. Another UAE company, DP World, has expressed interest to revamp ports in Liberia to effectuate smooth docking of vessels and cargo delivery. “The ports of Liberia can be used to transport products and goods to other neighboring countries in anticipation of exporting goods soon,” he said. DP World which has already done feasibility studies on ports in Liberia said it is ready to invest in the country. Meanwhile, the Liberian Leader will formally end his visit to the Emirates Thursday, by gracing the closing ceremonies of the 2019 Special Olympics. Liberia participated in the Olympics and won four medals including three gold medals and one bronze. The Special Olympic brought together over 7000 athletes with special needs and disabilities. Meanwhile, President Weah has hailed Liberia’s medalists and promised more support to the athletes. He mandated the government to organize appropriate ceremonies to give the athletes rousing welcome when they get home.